Love me some Leon Russell……….. THANK YOU SIR ELTON JOHN and THANK YOU LEON RUSSELL ! Leon’s music has repaired many a soul and helped a few more during the past 50+ years. The Union? Does that mean they are domestic partners, or what? What a lovely, feel good movie. There’s plenty more to say than that but that’s the place to start. Here’s a movie that begins with the mission of a person wishing to make someone they greatly admire feel some wonderful things, and when it’s all over the audience is feeling many of the same sensations. 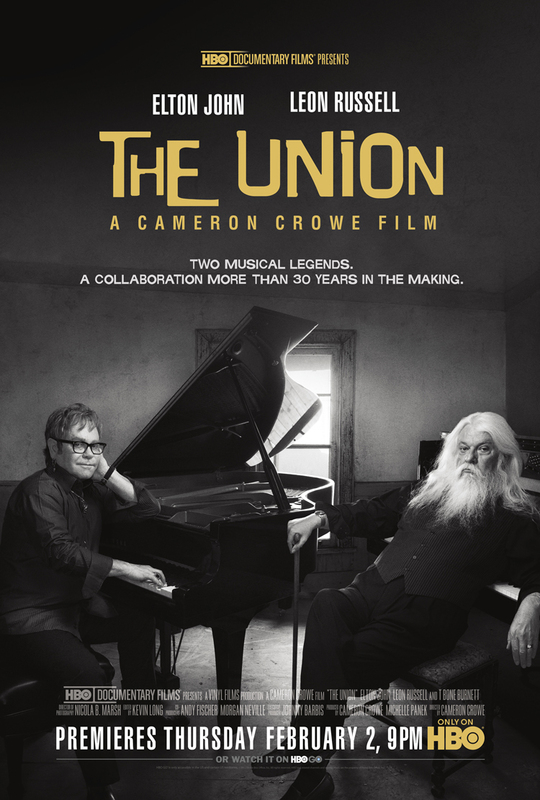 Where “Pearl Jam Twenty” was anchored on the stage, where we see the trials, tribulations and triumphs in how the band connects with the spectacle of the masses, “The Union” is anchored in the recording studio, as Elton John sets out to make a record with (and for) Leon Russell. We see the magic happen but from a documentary standpoint we are given magic. How hilarious and beautiful is it that when Elton and Leon first sit down to make music together they are in sync with one another, as if it confirms that Leon is the idol that Elton made him out to be all that time ago. Yet when Elton goes to give Leon a high five after that session Leon doesn’t recognize what the gesture is–“Is that a sports thing?” With the failed high five music itself will have to stand for the connection. I was reminded of the moment later on when Brian Wilson shows up, again the music having to stand in for the connection words or mannerisms might fail to recognize. Leon talks early on about how he doesn’t really have a process when it comes to creating. Though when Leon has brain surgery, and comes back into the studio 10 days later, he writes a song for Elton that is so obvious as to where it came from that it moves Elton to tears. Elton wanted to help out his idol but in the process nobody knew how his good will might have saved him in the process. It’s a beautiful moment. Elton speaks about how he wants to make music that’s true to himself, and would rather continue to do so than to reinvent himself or his music to get a greater mass interested. He’s content to sell less than for his music to mean less to him. But he does have one dream to be near the top of the charts, though it’s to see Leon’s name there. He’d rather be there for those starting out, or for those like Leon who inspired him. “The Union” is built around the process of making music, and releasing it. The histories of the individuals are told, how Elton and Leon might have had the chance to collaborate nearly 40 years ago (a revelation to Elton), and in the telling we see what is being brought to this union and this album. Yet it never feels anything less than intimate, we still feel like we’re in that studio, the film only opening up in the finale to give closure. Where as the concert scenes at the end of “Pearl Jam Twenty” felt like a band coming into their own after all these years, the concert that ends “The Union” feels like a release. After all, they are releasing an album, and that’s what the concert celebrates. It’s a tight film that feels like it approximates what it is to create and release music. Cameron responds very personally to Elton’s music, which served as a source of inspiration for his very personal film, “Almost Famous.” Cameron noted that the most important piece of music in that film was “Tiny Dancer,” that that was the one song he couldn’t do without. I remember Cameron relating a story about how moved and involved he was when hearing the song at an Elton concert, on a date gone bad. We can imagine how much of an inspiration Elton has been to Cameron–personally and as a filmmaker. For Cameron as a music journalist and filmmaker capturing the making of this album must have been irresistible. Though just as Elton is there for Leon Cameron is there for the both of them, with his own artistry, there to capture and celebrate the making of this album. This is an unabashed love letter to inspiration, to who and what inspires us. I am REALLY looking forward to watching it!!!! Leon is my favourite since 40 years and I´m so sorry not to be able seeing him on HBO in Sweden. And in Europe??? what’s the solution to see the documentary?? We can’t see HBO here!!! Hi All. I’ll check into the distribution plans in Europe. Stay tuned.. It was great. Loved Brian. all business as usual. A fan of Elton, Leon and T Bone since I was a kid. Came to NYC from Italy for the Beacon Theatre concert. Loved so much the album, a masterpiece. Now I cannot wait to be able to watch the documentary… I hope it will be shown soon here in Italy! Leon Sang “A Song For You” And Elton Sang ” Your Song ” Coincidence ? I Think Not ! Thanks For The Union Doc. Cameron. I feel blessed to have stumbled upon this last night. It makes one wonder about the number of hidden treasures wasting away in obscurity who still have so much to give and so much to live. Elton reopened a long closed door for Leon and Leon responded by being Leon. If done right this could almost be it’s own genre. Mr. Crowe is to be commended for his skillful and sensitive touch that prevented this from desending into a sacchran hard luck story and instead celebrates productive lives. I’ve loved Leon for 41 years, and I’ve been following the whole Union “thing” since since the original album publicity. What a beautiful tribute to both men this movie is. Leon’s place in American music history should be secure after this movie. I believe Leon is singing and playing even stronger now than he was in the first tour dates of the Union. It’s interesting that when he does his own shows now he doesn’t play any of the “The Union” music. I’m anxious for him to get into the studio for another record..
That’s wild that he doesn’t play any of the “Union” stuff! I am wondering if he played “Watchin’ The River Flow” when he toured with Dylan… one of both of their strongest tracks, for sure. mitzvah for leon, who deserves it. that one-of-a-kind sound and swampy feel all over again. bringing an ear man into the studio for him. elton’s gonna get into heaven for this! I saw the Speaking Clock Revue at the Bridge School Benefit shows in 2010 – blown away. Immediattely bought The Union which wound up being my fave release of the year. Your documentary – amazing storytelling. I felt like I was there. The Union gave us a rare look into the creative process of song writing and recording, especially in the beginning when Leon and Elton were working on “Hey Ahab” each at their own piano and discovering and writing the music right before our eyes! The camera placement gave the feel of looking in without being in the way. What a gift. Seeing Leon Russell in a way that has very seldom, if ever, been available to his fans. It feels like a real connection and the walls were broken down. I especially loved hearing Leon speak of liking “true” songs. He opened up in a way I have never been witness to in the over 40 years of being a fan and following his career. It is wonderful that through your work on The Union many more people will know about this amazing man. I am eternally grateful to Elton John and now, to you, for shining a light on Leon Russell… and Cameron, your ability to do it in such a respectful way is beyond words. Thank you, thank you, thank you. You have created another masterpiece, a work of art about music making and musicians, most importantly about two remarkable human beings. your film. It was such a gift! The way Elton loves Leon and his way of showing it was inspiring. Loved it. Leon is so real. Any way to watch without being on HBO Go? I would love to see this!! It’s airing on HBO and HBO on demand too. March 4th is the last time to view “The Union” on HBO on demand. I’ve surely enjoyed this magical piece by Mr. Crowe! Leon has been my fav since I was in high school back in the early 70’s, then Elton came along and I loved his music too but Leon’s mastery of so many genres keep him on top for me. The story of making the album and the stories of the past were wonderful. If Leon was not so reticent I’m confident he could write one hell of a book about his life and those he met along the way. Thanks to Elton for making all this happen!